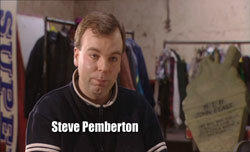 Met in College, Steve, Reece, Mark and Jeremy make up the brains behind the League of Gentlemen. 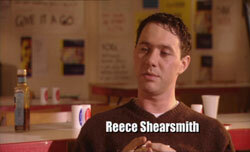 Steve studied at Bretton Hall Drama College in the University of Leeds. He was in the same year as Mark, both were good friends and worked together on a number of projects. Reece also went to Bretton Hall, but was in the year below, which makes him the youngest of the four gents. Being on the same course, Reece eventually met up with Mark and Steve during a production and found they had a lot in common so the rest is history. As well as the work he does for the LoG Mark is also an avid Sci-Fi fan, having written books and audio plays for Dr. Who. I've listed them in the Localshop for those that are curious, although admittedly I'm not a big Dr. Who follower so you'll have to read it yourselves to find out if its any good! Jeremy met up with the rest of the gang during their Bretton Hall years although he was studying Philosphy at the time. A friend of Marks introduced them and again their common traits forged a strong friendship. 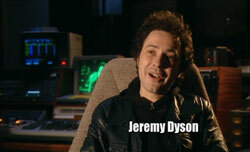 Jeremy is the silent partner of the League of Gentlemen syndicate. 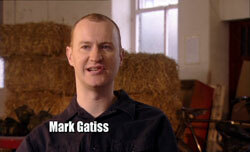 He usually writes with Mark and is the assistant producer during filming. However, he has been known to make rare Alfred Hitchcock-esk cameos, which you have to be on the ball to spot. To start your 'Jermey spotting' off take a look at the stand-up comedy scene in Epsisode 3, Series 3, when Geoff is dying a death on stage, did you recognise the heckler?! His top 5 fave films are: The Godfather, Night of Demons, Withnail and I, Jason and the Argonaughts and The Private Lives of Sherlock Holmes. The character he has most affinity to is Les McQueen because he's played in so many bands and has had as much success as Les. He is a perfect gentleman but only by his own definition which he refuses to share with anyone. Comedy influences include: Alan Bennet, Victoria Wood, Monty Python and Rising Damp. He was told they had a fan of the League of Gents who was 6 years old and he said that was a terrifying thought and what was she doing letting her six year old son watch it. His fave authors are: Raymond Carver, John Fowles and Robert Aickman. When asked about his book Never trust a rabbit he said that his fave story was 'Engine of Desire' but that they were all his children. Reece liked 'City Deep' and the other two hadn't finished reading it so had no comment as yet. It took 2 years and 7 months to write. When they filmed Chinnery and the exploding dog story Mark had to go to an eye hospital to be treated for a grazed cornea. He said if you look closely you can actually see the pained expression on his face. Asked what his fave type of music was he said he was too old to have a fave type and just liked good music. If he had to be a character from the League of Gents he would choose Hillary Briss because he gets away with murder. Asked what he did for New Year he said that he went to a party in Leeds with his girlfriend and they were the only couple without children and left feeling inadequate.